Figure 3-57.Welding gloves and mitts. 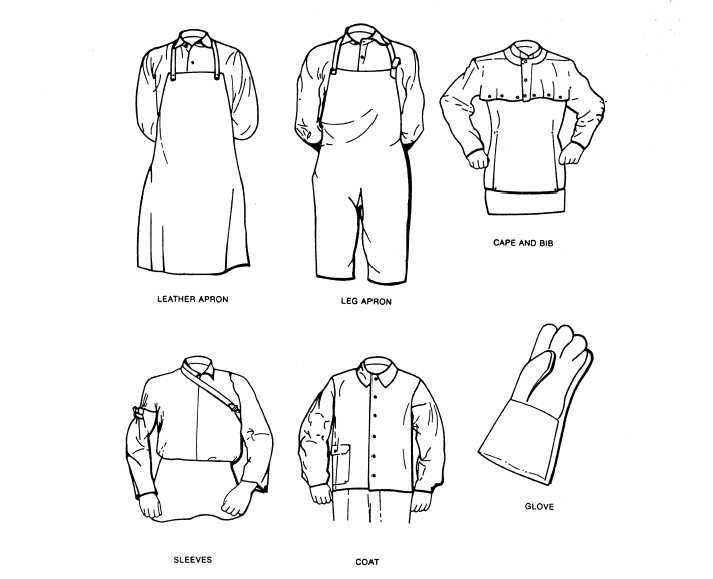 Home > Construction Training Manuals > Steelworker Volume 01 > Figure 3-57.Welding Gloves And Mitts. with the size, location, and nature of the work to be performed. During any welding or cutting operation, you should always wear flameproof gauntlets. (See fig. 3-57.) For gas welding and cutting, five-finger gloves like those shown in view A should be used. 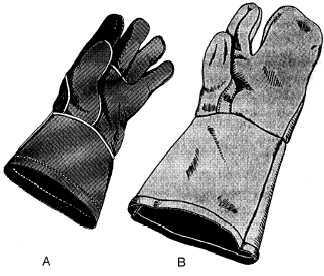 For electric- arc welding, use the two-finger gloves (or mitts) shown in view B. Both types of gloves protect the hands from heat and metal spatter. The two-finger gloves have an advantage over the five-finger gloves in that they reduce the danger of weld spatter and sparks lodging between the fingers. They also reduce finger chafing which sometimes occurs when five-finger gloves are worn for electric-arc welding. Figure 3-57.-Welding gloves and mitts.